Women in Saudi Arabia are planning a nationwide protest on October 26 intended to end the longstanding ban on female driving. The protest will involve Saudi women with international driving licenses getting behind the wheel and daring the authorities to stop them. This is not the first attempt at civil disobedience against the ban. In 2011, a Saudi court sentenced a woman to 10 lashes for her attempt to drive, and in 1990 large scale protests led to dozens of arrests. The current protest is benefiting from an outpouring of support on social media sites and a robust online presence. The current controversy is bringing international attention to the role of women in Saudi society, but more broadly the kingdom has a poor reputation globally for how it treats its citizens. 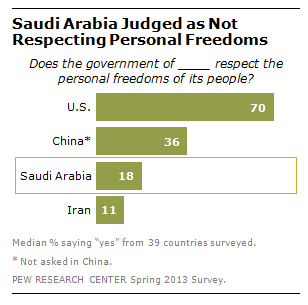 In a spring 2013 survey, a median of only 18% across 39 countries said that the government of Saudi Arabia respects the personal freedoms of its people. This compares with a median of 70% who say the U.S. respects human rights, and 36% who believe the same about China. Saudi Arabia does score higher in this regard than Iran, but few publics have a high opinion about either government’s treatment of their own people. Overwhelming majorities in Europe, the U.S. and Canada say the Saudi regime does not respect the personal freedoms of its people. In some of Saudi Arabia’s neighboring countries, many also express disapproval of the regime’s track record in human rights. For instance, majorities in Lebanon (71%) and Turkey (64%) say that the Saudi government does not respect the rights of its people. Overall, a recent Pew Research Center survey found favorability of Saudi Arabia falling in both Turkey and Lebanon. However, in other nations with close ties to Saudi Arabia, such as Pakistan, Egypt, and Jordan, opinions about Saudi Arabia and the treatment of its people are more positive. Nearly two-thirds in Pakistan (65%) say the Saudi government respects personal freedoms, with roughly six-in-ten in Jordan (60%) and Egypt (59%) agreeing. In response to criticism of its human rights track record, the kingdom is showing signs that it might be ready to modernize, at least a little. Following the protest movements of 2011, Saudi King Abdullah announced women would be allowed to vote for the first time in the 2015 municipal elections. Hopefully, the polling booths will be within walking distance.